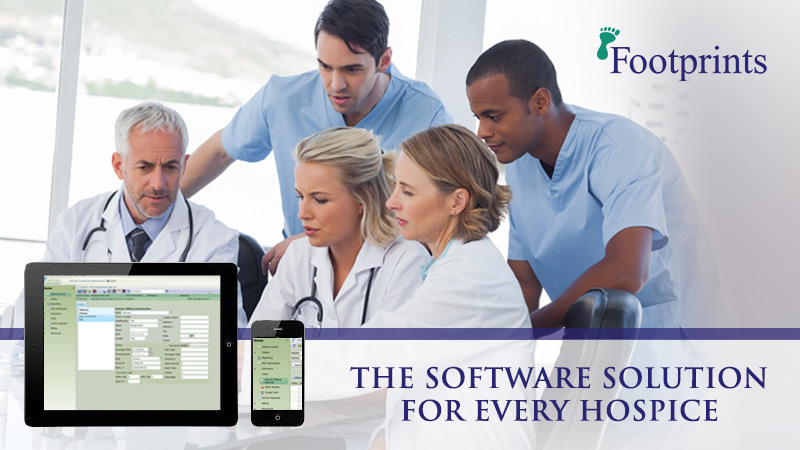 Footprints EMR is a comprehensive hospice management software that integrates and tracks patient medical records and their clinical plan of care. Palliative Care EMR is the nation’s first application that integrates and tracks patient records for pain management care and automated billing record management. Billing Services Reduce administrative costs, streamline your billing processes, and increase billing accuracy with our automated billing solutions. Designed especially for Hospices and Palliative Care providers and EMR training centers. Footprints EMR is a comprehensive solution that integrates and tracks patient medical records, clinical plan of care, billing and finance, quality assurance, donations, management tools and reports, and volunteer services. You can provide optimal care with real time prompts for patient follow-up and Medicare requirement reminders that integrate with your calendar. Footprints EMR may be run with or without Internet access and can be hosted on your servers or ours. We are proud to be first to market with a solution that allows any authorized user to access the system via any mobile or web enabled device. Footprints by Blackbean Software provides software for small to mid-size companies in the Hospice industry, as well as multiple location hospice service providers. This system offers a full suite of functionality with point of care, billing, scheduling, accounting, human resources, and customer relationship management. Included in Footprints’ billing and accounting capabilities is UB-04 and HCFA 1500 support, claim scrubbing, electronic remittance and more. The billing dashboard posts alerts that notify users of important tasks and any changes that will affect billing. It also contains a pre-billing audit that validates claims before sending them, ensuring that each claim has all of the requisite accurate data. Customizable dashboards and forms allow users to tailor the software to a look and feel that matches their business. This software can be deployed both on-premise and on the web, making it accessible on mobile devices for easy point of care charting. Call us now at (800) 595-6164 to learn more about how we can help you!